Savor delicious breakfasts, lunches and dinners in Eureka Springs at Best Western Inn of the Ozarks' popular Myrtie Mae's Cafe, renowned for it's delicious home style cooking and wide variety of menu items. As one of Eureka Springs' oldest dining traditions, Myrtie's dishes up hearty breakfasts, daily lunch specials, mouth-watering dinners, fresh homemade desserts, and the most bountiful salad bar in Eureka Springs. 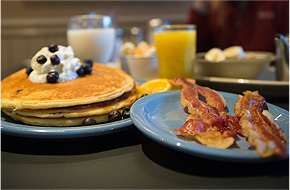 All the breakfast classics like pancakes, eggs, and baked goods to start your day, and a few new twists thrown in. Soups, salads, burgers, sandwiches, lunch plates, and our soup & salad bar. Save room for one of our sweet treats. 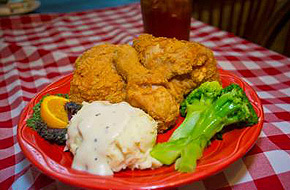 Myrtie's "Famous Ozark Fried Chicken" and other country favorite dinners. Steaks and seafood too!